Crazy Six should receive an award for Best Liner Notes – “The Eastern Bloc has fallen, and Communism is dead. In its place has come new opportunity – but not without a deadly price. Powerful Mafia families have emerged from the anarchy to vie for control of the lucrative underground weapons and technology trade.” Sounds like a pretty solid action thriller, and that’s what I expected. 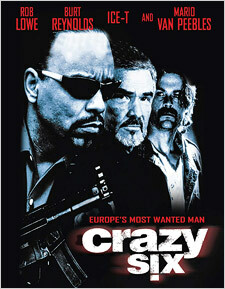 With a cast that includes Rob Lowe, Burt Reynolds, Ice-T, and Mario Van Peebles, it must be pretty good, right? Wrong! Directed by Albert Pyun (Cyborg, The Wrecking Crew), the film is awash with style overlaid onto a dreary, sluggish plot. A director needs to hook the viewer within the first 15 minutes. So I watched patiently, waiting for the plot to kick in, but all I saw was the camera switching back and forth between ex-junkie/singer Anna (Ivana Millicevic) with silver-flecked eyelids singing dreary Euro-pop songs in a bar, and expressionless crackhead Billie (Rob Lowe) watching her. Billie is nicknamed Crazy Six because he’s the sixth child of his family and is crazy for drugs. This opening scene goes on far too long. When an action picture offers at least a few exciting high points, a weak script can be excused, but Crazy Six doesn’t even provide these. A scene in which Van Peebles’ Dirty Mao and his thugs break in on rival gangster Raul (Ice T) is so mechanical, with so little emotion, that it comes off as a nonchalant throwaway when it should be a major moment. It arrives and is over before we can digest its dramatic impact. Pyun fails to recognize that what few action scenes exist should be played up with suspense, foreboding, and exciting staging. Pyun’s handling of the actors really sinks the production. Lowe’s performance is incomprehensible. Is he conveying profound existentialism, poorly directed, or simply bad? Whatever the answer, he’s virtually a nonentity. As Dirty Mao, Van Peebles assumes a French accent, wears clothes we’ve last seen in blaxploitation flicks of the 70s, and carries a terrified-looking chihuahua. Reynolds plays Dakota, a Stetson-wearing cop who delivers lines patterned after Tarantino dialogue that fall flat. However, he does pick things up a bit and at least tries to give his character a quirky panache. Director Pyun is best known for science fiction and action movies, and is considered a pioneer of independent genre cinema. Lacking a decent script and failing to elicit credible performances in Crazy Six, he takes the movie down the path of artsiness to distract from its dullness. He bathes characters and sets in colored light (Lowe looks like he wandered in from The Walking Dead with a pale blue light on his face), has actors mumble their lines, and uses that mournful song that Ms. Millicevic sings in an attempt to create a hypnotic, smoke-filled milieu. Nothing works. He simply can’t overcome a torpid pace in the first 45 minutes and loses the viewer. Sound on this release is terrible. Though it has a 2.0 stereo soundtrack, the blend of dialogue (what there is of it), sound effects and music is uneven, making it difficult to hear what the actors are saying because the music isn’t appropriately muted. Turning up the sound only makes things worse. Where was the sound mixer? Picture, on the other hand, is sharp and is much improved over earlier releases on VHS. A direct-to-video release, Crazy Six is a dreadful film with little redeeming value. Even the impressive cast doesn’t elevate the proceedings, making it a thorough waste of time. Bonus materials on the widescreen R-rated Blu-ray release are theatrical trailers from Black Eagle, Lionheart, Walking Tall, and the Albert Pyun-directed Blast.